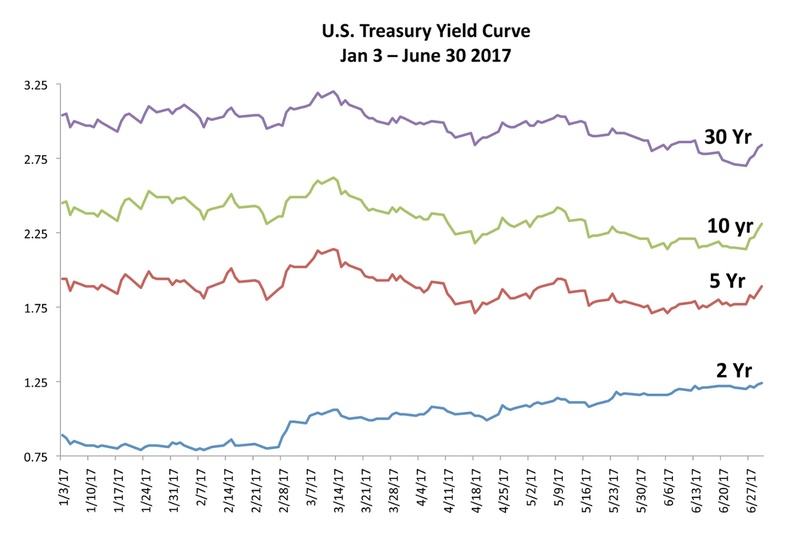 The slope of the yield curve has been flattening in recent weeks, with short-term rates rising faster than longer bond yields. This typically occurs when monetary policy is tightening. The difference between five-year Treasury notes and 30-year Treasury bonds flattened to 96 basis points in June, the narrowest since December 2007. Five-year note yields, which are highly sensitive to rate policy, rose to a four-week high of 1.80%. Thirty-year bond yields, which are largely driven by future expectations of growth and inflation, meanwhile dropped to 2.72% in mid-June, the lowest since Nov. 9. A key market dynamic are long-term bond prices that are set by the markets, while short-term rates are dictated by the Fed in the form of the Federal Funds rate. Global government bonds sold off in late June as language from various central banks alluded to the end of monetary stimulus and a start to rate increases. In reaction, government bonds in Europe, the U.S., and Asia fell in price in anticipation of rising yields.